There will never be two RÉGINE's! JANINE CAFÉ has its very own feel, menu and decor. 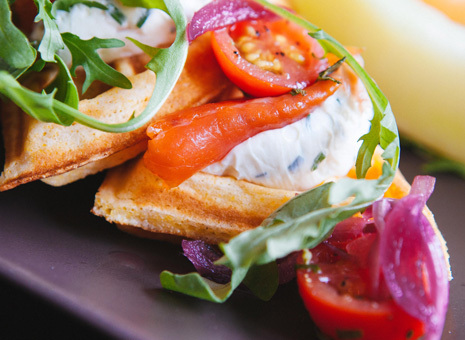 You’ll find the same quality, comfort, warm service and decadent dishes that you enjoy at RÉGINE... we promise! Tante Régine is an imaginary persona inspired by the ideal of a loving, doting aunt who always embraces you with open arms and, above all, never lets you leave with an empty stomach. To spoil and pamper you, everything is prepared on the premises—the cinnamon buns, scones, ham on the bone, baked beans—you name it. And we never compromise on quality. Served every morning. A daily celebration! 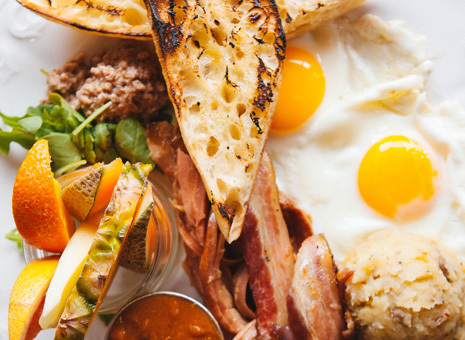 Whether your day starts at 8 AM or 1 PM, our creative and original dishes highlight local flavours and Montreal culture. Ready in a flash and always fresh! There is something to please all palates at lunchtime. Allow Chef Anne-Claudine to regale you with one of her tasty gourmet sandwiches or another one of her many other delicious offerings.